Lance Booth - lbooth@shawmedia.com A CNC Vertical Mill makes graphite grinding wheels at Aero Industry Inc. in Harvard on Wednesday, February 8, 2012. 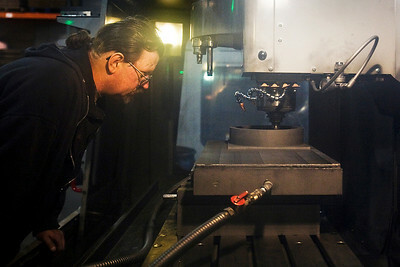 Lance Booth - lbooth@shawmedia.com John Doyle, of Midlothian, is a shop foremon at Aero Industries Inc., makes graphite grinding wheels in a CNC Vertical Mill in Harvard on Wednesday, February 8, 2012. Lance Booth - lbooth@shawmedia.com Jim Clingingsmith, left, and Gary Kinshofer, are the owners of Aero Industries Inc. in Harvard, which supplies a variety of graphite products. Lance Booth - lbooth@shawmedia.com Jim Clingingsmith,right, and Gary Kinshofer, are the owners of Aero Industries Inc. in Harvard, which supplies a variety of graphite products. Lance Booth - lbooth@shawmedia.com Aero Industries Inc. in Harvard, produces a variety of graphite products. 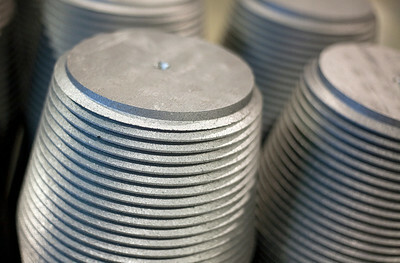 Aero Industries Inc. in Harvard, produces a variety of graphite products.